You know you're in for something extraordinary when even the turn-off-your-phone announcement is wonderful. Before Alex Borinsky's school-pageant-styled Of Government begins, we're plied with cookies and pie—each, we are assured, P.T.A.-made. There's lively preshow accompaniment played by Ms. Marjorie Blain (Beth Griffith), a beaming pianist so lacy and insubstantial she might have been crocheted. Then, channeling the sweetness of your favorite kindergarten music teacher, Ms. Marjorie asks us to participate in a little call-and-response. “Who's got a body?” she sings. “I've got a body!” we respond on cue. “Who's got a cellphone?” We all duck and rustle in our bags. Such charm and detail is threaded all through Of Government, the second offering in the 2017 edition of Clubbed Thumb’s Summerworks Festival. If ever a political play were huggable, this would be it. The show begins with an earnestly delivered DIY musical, composed by Joe White, in which everything seems to have been made out of felt and/or very glittery shower shoes. A rebellious mermaid (Melle Powers) tells her father Poseidon (Beth Dixon) that she's leaving the reef, warbling, “Your warnings cannot preempt me!” We're thus introduced to Borinsky's theme of inadequate hegemonic governance while the world's glummest backup mermaid (Keilly McQuail) flails gauze seaweed around. It's delicious. After the mermaid musical, we move into a series of (largely) realistic scenes, which Borinsky and keen-eyed director Jeremy Bloom push—just slightly—into the absurd. At first, everything's normal. 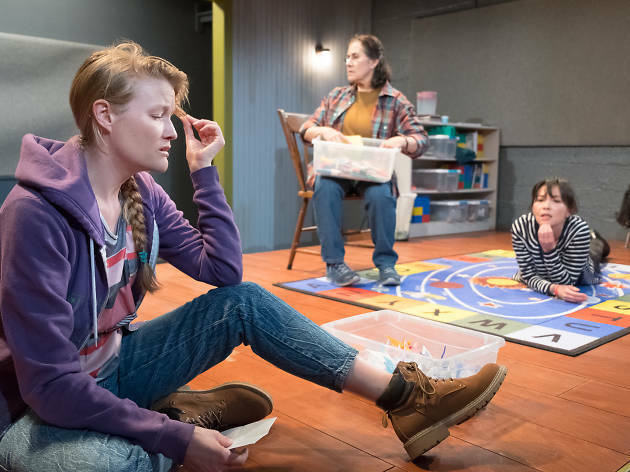 Grown-up Debbie (Stacey Yen) returns to her old one-room schoolhouse in Montana, hoping to find succor from her beloved teacher Barb (Socorro Santiago). 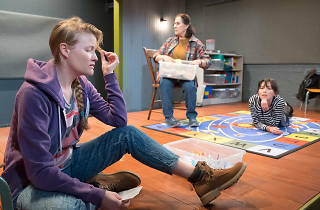 Barb, though, has problems too: Her friend Heidi (the transcendently funny Emily Davis) is the local oddball, and another ex-student, Tawny (McQuail again), shows signs of instability. Borinsky can write like blazes—and he likes to prove it—so amidst the forest of naturalistic dialogue, huge gouts of monologue suddenly rear up. Tawny goes loquaciously mad in one scary scene, which seems necessary to the plot, but how to explain Beth Dixon's aria about a small town losing its grocery store? Who cares! It's a comic masterpiece, and all I can say is it seemed necessary at the time. But all this hilarity does not disguise the fury at the show's core. (“Who's got rage?” is another of Ms. Marjorie's questions.) A hint at its origins is right in the title. Everything that goes wrong in Of Government can be traced to some systemic failure, some way in which the U.S. fails its people. Barb’s school is closing down because of a bureaucratic mix-up; Tawny's meltdown is tied to our grotesque healthcare system. The cuddly school-auditorium vibe of the beginning returns at the end, but this time its point is sharp. If we want to fix the things we've seen, we need to organize on the local level. We need to start baking those pies. The Wild Project (Off-Off Broadway). By Alex Borinsky. Directed by Jeremy Bloom. With ensemble cast. Running time: 1hr 30mins. No intermission. Through June 15.